The Requiem in C minor is scored for a conventional orchestra, apart from the omission of flutes and the addition of a tam-tam. Cherubini was particularly anxious to reflect the spirit as well as the meaning of the text and so, to avoid any unwelcome associations with the opera house, he decided to dispense altogether with soloists. The work opens with a hushed Introit and Kyrie, whose dark tones rarely rise much above piano. This is followed by a short Graduale. Not surprisingly, Cherubini is at his most dramatic in the Dies irae, which opens with a flourish from the brass in unison, interrupted by a single, arresting stroke on the tam-tam. This highly unconventional gesture caused something of a stir at the time. Scurrying strings add to the mood of tension and foreboding, before the brass once more blazes forth. The Offertorium contains some beautiful three-part choral writing, accompanied by upper strings and woodwind, and ends with a vigorous fugue at the words ‘Quam olim Abrahae’. A short Sanctus is followed by the Pie Jesu, which is in the form of three simple verses. The powerful opening of the Agnus Dei eventually gives way to a quieter section, until at the final pages sparsely-accompanied unison writing brings the Requiem to a resigned conclusion. 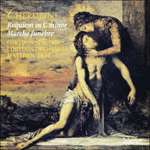 The work is full of attractive choral and orchestral writing, rhythmic invention and skilful counterpoint, for which Cherubini was justly renowned, but in more recent times it has not fared well in the company of other more immediately appealing works. One has only to consider the intensity of Mozart’s Requiem, the visionary quality of Brahms’s, the dramatic impact of Verdi’s and the poignancy of Fauré’s to understand why Cherubini’s setting so rarely features in today’s choral repertoire, yet it has many fine qualities and surely deserves to be heard more frequently. Le Requiem en ut mineur est écrit pour un orchestre conventionnel, excepté l’omission de flûtes et l’ajout d’un tam-tam. Cherubini tint particulièrement à refléter tant l’esprit que le sens du texte. En outre, et pour éviter toute association fâcheuse avec l’opéra, il décida de se dispenser de solistes. L’œuvre s’ouvre sur un profond Introït et Kyrie—dont les sonorités étouffées dépassent rarement le piano—, suivi d’un court graduel. Fait non surprenant, Cherubini atteint au paroxysme de son drame dans le Dies irae, qui débute avec une fioriture des cuivres à l’unisson, interrompue par un unique coup, impressionnant, sur le tam-tam. Ce geste, hautement non-conformiste, fit grand bruit à l’époque. Les cordes, précipitées, ajoutent à la tension et au pressentiment, avant que les cuivres s’enflamment à nouveau. L’offertoire, qui recèle une belle écriture chorale en trois parties, accompagnée par les cordes aiguës et les bois, s’achève avec une vigoureuse fugue sur les mots «Quam olim Abrahae». Après un bref Sanctus, le Pie Jesu paraît sous la forme de trois versets simples. L’ouverture puissante de l’Agnus Dei cède finalement la place à une partie plus calme jusqu’à ce que, dans les pages ultimes, l’unisson peu accompagné amène le Requiem à une conclusion résignée. L’œuvre regorge d’écritures chorales et orchestrales attrayantes, d’inventions rythmiques et de contrepoints habiles, pour lesquels Cherubini fut à juste titre renommé. Mais dans des temps plus récents, elle n’émergea pas du flot d’œuvres plus immédiatement séduisantes. Il n’est que de considérer l’intensité du Requiem de Mozart, la qualité visionnaire de celui de Brahms, l’impact dramatique de celui de Verdi et le caractère poignant de celui de Fauré pour comprendre pourquoi la mise en musique de Cherubini figure si rarement dans le répertoire choral actuel. Cette œuvre, qui renferme pourtant nombre de belles qualités, gagnerait assurément à être plus souvent entendue. Das Requiem in c-Moll ist abgesehen von dem Auslassen der Flöten und dem Zufügen eines Tamtam für herkömmliches Orchester instrumentiert. Cherubini war im besonderen darauf bedacht, den Geist als auch die Textbedeutung zum Ausdruck zu bringen, und um unerwünschte Beziehungen zur Oper zu vermeiden, entschied er sich, auf Solisten zu verzichten. Die Arbeit beginnt mit einem gedämpften Introit und Kyrie, dessen dunkle Töne sich kaum über das Pianoniveau heben. Hiernach folgt ein kurzes Graduale. Es überrascht nicht, daß Cherubini seine dramatischsten Höhen im Dies irae erreicht, das schwungvoll durch den Einklang der Blechbläser beginnt, unterbrochen von einem einzelnen, atemberaubenden Schlag des Tamtam. Diese höchst unkonventionelle Geste verursachte zu jener Zeit einiges Aufsehen. Trippelnde Streicher leisten ihren Beitrag zur Stimmung der Spannung und der Vorahnung, bevor die Blechbläser nochmals voranschnellen. Das Offertorium enthält ein wunderschönes dreiteiliges Chorstück, das von oberen Streichern und Holzbläsern begleitet wird und mit einer leidenschaftlichen Fuge der Worte „Quam olim Abrahae“ abschließt. Ein kurzes Sanctus wird gefolgt von einem Pie Jesu, das aus drei einfachen Strophen besteht. Der kraftvolle Beginn des Agnus Dei weicht schließlich einer ruhigeren Passage, bis der spärlich begleitete Einklang der letzten Seiten das Requiem zu seinem Abschluß bringt. Das Werk ist gespickt mit attraktiver Chor- und Orchestermusik, rhytmischen Ideen und geschickten Kontrapunkten, denen Cherubini gerechterweise sein Ansehen verdankt. In jüngster Zeit erging es seinen Werken jedoch im Zusammenhang mit anderen eher unmittelbar ansprechenden Arbeiten weniger gut. Man sollte die Intensität von Mozarts Requiem, die visionäre Qualität von Brahms, die dramatische Kraft von Verdi und die Wehmut von Fauré erwägen, um verstehen zu können, weshalb Cherubinis Stück so selten zum heutigen Chorrepertoire gehört; es hat jedoch viele feine Qualitäten und verdient es sicherlich, öfter gehört zu werden. Exaudi orationem meam: ad te omnis caro veniet. and a vow will be paid to you in Jerusalem. Hear my prayer: to you all flesh will come. and need fear no evil from judgement. as David and the Sibyl bear witness. to judge all things strictly. will drive mankind before the throne. to answer to the judge. out of which the world is to be judged. What will I say then, wretch that I am? When even the righteous may hardly be secure? save me, you source of holiness. that I am the cause of your pilgrimage. Do not forsake me on that day. let not such toil be in vain. before the day of reckoning. to me also you have given hope. that I not burn in everlasting fire. sitting me at your right hand. Call me together with those who have been blessed. take care of my end. Domine Jesu Christe! Rex gloriae! quam olim Abrahae promisisti, et semini eius. Lord Jesus Christ! King of Glory! from the punishments of hell and from the deep lake. as you once promised to Abraham and his seed. Prayers and sacrifices of praise, Lord, we offer to you. Sanctus, sanctus, sanctus Dominus Deus Sabaoth! Pie Jesu, Domine, dona eis requiem. Pie Jesu, Domine, dona eis requiem sempiternam. Holy Jesus, Lord, grant them rest. Holy Jesus, Lord, grant them eternal rest. with your saints for ever, for you are holy.